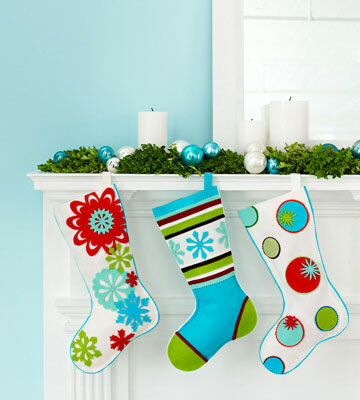 Kick off the holidays by hanging stockings adorned with an exuberant mix of stripes, snowflakes, and spots. Here's how: Using stocking template, cut out the front and back. 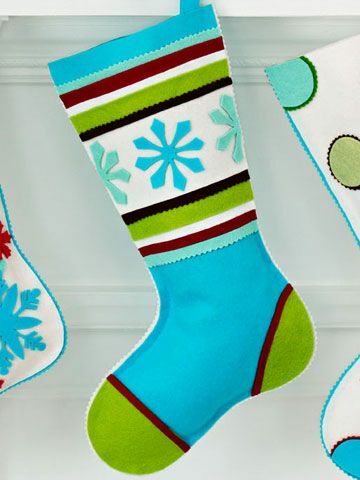 For contrasting color trim, cut a 1/2-inch-wide strip long enough to go around the outside of the stocking. Glue strip to one of the pieces, letting it extend past the edge. Decorate the stocking front as desired (see next slides for further instructions). Glue the back of the stocking to the front. Cut along the trim with pinking shears. 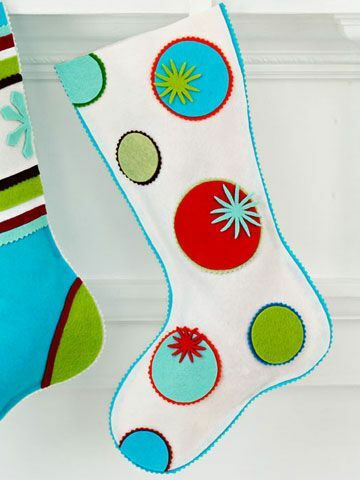 To hang, cut a small strip of felt and glue inside the stocking. Here's how: Using an iron on medium heat, adhere freezer paper waxy-side down to a piece of felt. Trace stocking circles onto felt and cut out, using pinking shears on some circles. 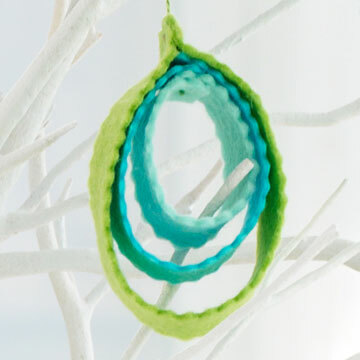 Peel off freezer paper and glue circles onto stocking with quick-setting gel glue. Cut more freezer paper to 5-x-7-inch sheets and flatten under a stack of books. Print out starburst templates onto freezer paper sheets, adhere freezer paper to felt as above. Cut out shapes and glue onto circles. Here's how: Cut freezer paper to 5-x-7-inch sheets and flatten under a stack of books. Print out snowflake templates onto freezer paper sheets. We used designs from clipart.com and 414 Geometric Designs and Motifs (Dover Electronic Clip Art). Using an iron on medium heat, adhere freezer paper waxy-side down to a piece of felt. Cut out snowflakes using sharp scissors; peel off paper. Arrange on the stocking and adhere with quick-setting gel glue. Here's how: Cut felt into various-size strips, trimming some with pinking shears. To create pattern, glue strips onto felt as shown. Decorate with snowflakes following snowflake instructions (on previous slide). Trace stocking's heel and toe shapes onto felt, cut out, and glue onto stocking. 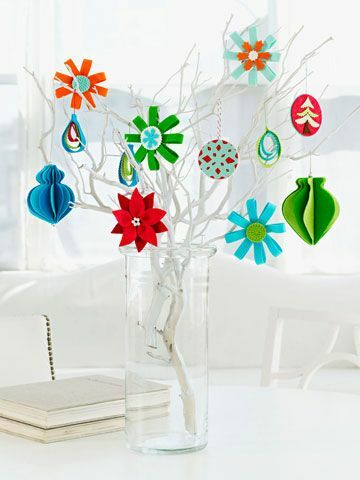 Flex your tree-trimming skills by dangling a selection of colorful ornaments on branches in a vase. Here's how: Cut felt into 4 strips, each measuring 9 inches x 1 inch. Glue each end together in a loop. Layer loops in "X" formations to make a rosette pattern and glue together in the middle. 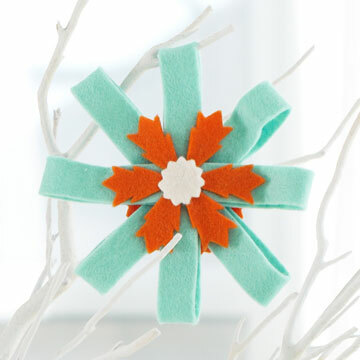 Glue a felt embellishment (like a snowflake or circle) in the center of the loops. Once dry, thread ornament string through a loop to hang. Here's how: To create the ornament's spine, roll a thin piece of card stock (like a magazine subscription card) into a tight cylinder the same length as your ornament and glue edges together. Cover with a layer of felt and glue in place. Using an iron on medium heat, adhere freezer paper waxy-side down to a piece of felt. Trace 3-D ornament template onto felt and cut out 12 shapes, six of each color. Peel off paper. Add quick-setting gel glue to the straight edge of each ornament piece and attach to the felt covered cylinder, alternating colors, until completely covered. Once dry, thread a loop of ornament string through a bead and glue it inside the cylinder. Cut felt into 1/2-inch wide strips of the following lengths: 8 1/2, 6, and 5 inches. Cut with pinking shears if desired. Form the 5-inch-long strip into a circle, slightly overlapping the ends, and glue to secure. Loop the 6-inch-long strip around the 5-inch piece and glue to secure. Wrap the last strip of felt around the smaller two loops, add a length of embroidery thread between the large loop's ends and glue together to secure. Leave a length of thread at the top to hang ornaments. Using an iron on medium heat, adhere freezer paper waxy-side down to a piece of felt. Trace ornament circle (choose one from the template) onto felt and cut out shapes. Select a circle to use as the snowflake design, fold it in half and cut designs along the fold and around the edges like you were cutting paper snowflakes. Unfold and fold in the opposite direction, making cuts along the fold. Fold again in the diagonal direction, make cuts and repeat for the opposite diagonal. 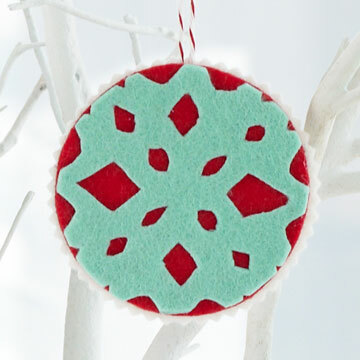 Glue the snowflake cutout onto another felt circle, then glue a loop of bakers' twine behind it to hang. 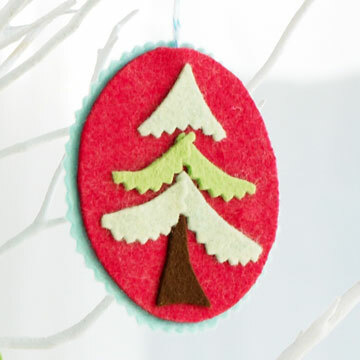 Glue a last circle of felt over the twine and trim around the circle with pinking shears. Using an iron on medium heat, adhere freezer paper waxy-side down to a piece of felt. Trace ornament circle template onto felt and cut out shapes. Glue a loop of bakers' twine behind a circle to hang. Glue another circle over the twine and trim around with pinking shears. 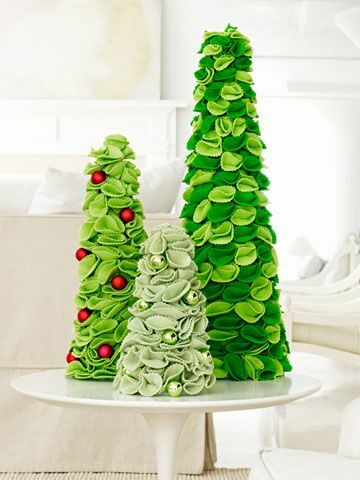 Attach freezer paper to brown and green felt. Trace tree template onto felt and cut out shapes. Peel off paper. 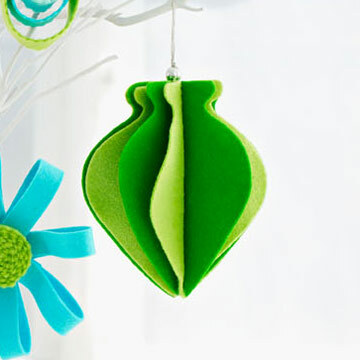 Glue the felt pieces in a tree shape onto the ornament. Bring some forest flair to a side table with a trio of faux fir. 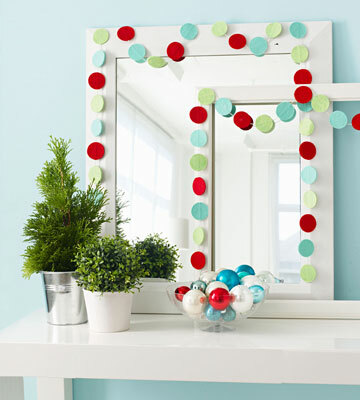 For a cheerful garland, simply connect the dots. 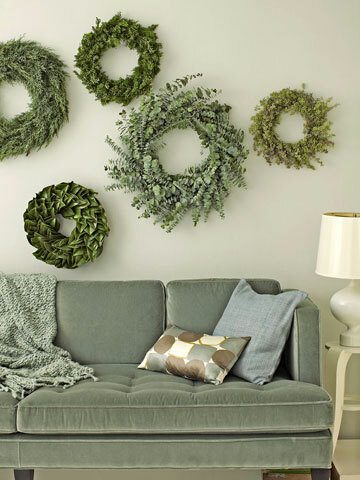 Craft a corsage for living room walls—green thumb not required. 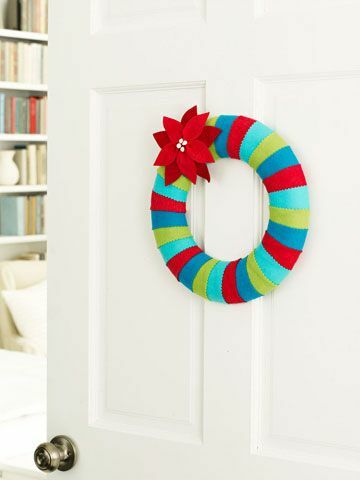 A striped wreath lends a jolly vibe to interior doors—and will last from year to year. Here's how: Cut strips of different colors of felt in varying, random widths. Our widest strip is about 1 1/4 inches. Mixing colors, wrap strips around a Styrofoam wreath form, each piece overlapping the previous slightly, pinning or gluing to the back of the Styrofoam as you go. 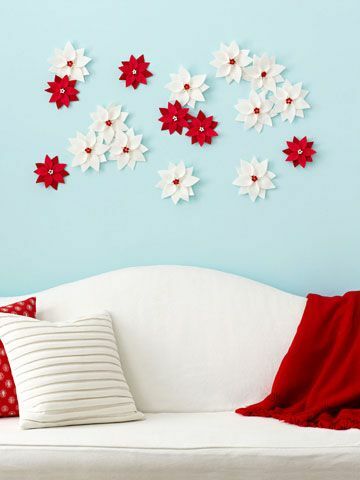 Decorate with a felt poinsettia (following our instructions for wall poinsettias) if desired. 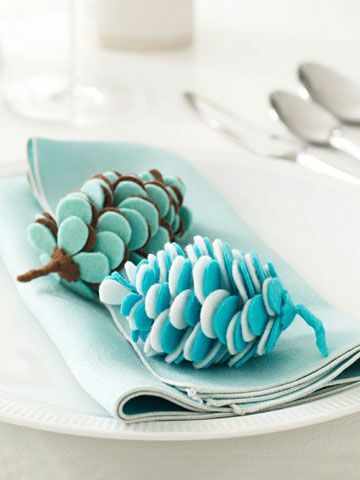 Set cozy pinecones atop each place setting for a dash of woodland whimsy.